Páirc Tailteann was the venue for this Hoganstand.com Meath Senior Football Championship Group B Round 5 match played on Sunday afternoon in conditions which were far from ideal as the rain fell continuously before and during the game. Thanks to this incessant rain the Páirc Tailteann sod was very greasy and consequently over the course of the hour there was plenty of slipping and handling errors. Going into the match Seneschalstown knew a draw would guarantee their survival in the Senior ranks for another season while Ballinlough were in search of the victory they needed to keep alive the possibility of qualification for the knockout stages of the competition. Both sides lined out unchanged from their last Championship outing when they were both successful, Ballinlough toppling Navan O’Mahonys and Seneschalstown edging out St. Patrick’s in what was a relegation battle. Joe Sheridan opened the scoring for Seneschalstown in the fourth minute of the match, firing over a superb score from a narrow angle out on the right after being picked out by Brian Sheridan. He then extended his sides early advantage four minutes later when he sliced an effort over off the outside of his right boot. On ten minutes Ballinlough registered their opening score of the game when Benji Smith advanced upfield from his corner back position to show his forwards the way to the posts and point. Peadar Byrne got in on the act soon after when he got on the end of a patient build up, involving Colm Mallen, Johnny Reilly, Ronan McGuinness and Sean Geraghty, to point and bring the sides level. Bryan Clarke curled over a great effort to edge Seneschalstown back in front. Ballinlough then equalised when Colm Mallen sent over a magnificent point before Kevin Devine sent a free over the bar to edge one clear. Devine’s free came about when Peadar Byrne went to ground but after initially gesturing to him to get up referee David Gough then changed his mind and awarded him a thirteen metre free. Adam Carey tagged on another score for Seneschalstown before Ballinlough replied with two points, one from a Colm Mallen free, the other a fantastic score from Cian Mallen after good work by Tommy McCullen, as they opened up a two point advantage, 0-06 to 0-04. Bryan Clarke reduced the deficit to the minimum with just three minutes remaining in the opening period. The games real turning point arrived shortly after when Joe Sheridan sent a dangerous side line ball in towards the Ballinlough goal which deceived everyone and ended up in the top left hand corner of the net. This proved to be the final score of the opening half and left Seneschalstown in the driving seat as they now held a two point advantage, 1-05 to 0-06. It took just fifty one seconds of the second half for its opening score to arrive and when it did it was Bryan Clarke who pointed when after Joe Sheridan saw his effort blocked down Clarke reacted quickest and into the hospital end of the ground he kicked high and between the uprights. Just minutes later Seneschalstown full back Cormac Noonan received a black card from David Gough following a dangerous challenge on Lorcan Maguire, which saw the Ballinlough centre back needing to be helped off the field. Peadar Byrne brought the margin between the sides back down to two points when sending a booming effort over from outside the forty five on thirty six minutes but Brian Sheridan cancelled this out soon after when he tapped over a thirteen metre free which was awarded when Bryan Clarke was fouled as he attempted to shoot for goal. Brian Sheridan was to extend his sides lead to four points on forty one minutes, before Joe Sheridan then brought his tally for the day to a goal and three points when he sent over following good work from substitute Niall Lyon. This was to prove to be his sides last score for eighteen minutes as they proceeded to miss a number of opportunities while Ballinlough pointed twice entering into the final quarter, firstly from a Kevin Devine free and secondly from a exquisite Peadar Byrne effort from play, after a powerful run from midfield. As the clock ticked slowly towards the sixtieth minute referee David Gough had his attention drawn by one of his umpires to an incident in the Seneschalstown defence and after a brief consultation he strode out towards the twenty one metre line before brandishing a red card to the Ballinlough talisman Peadar Byrne for what appeared to be a strike on one of the Furze defenders. 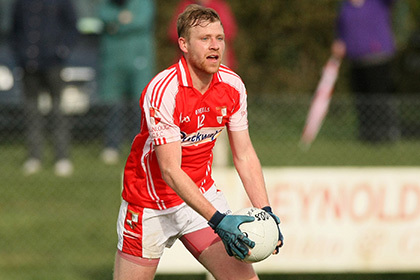 By now the game was petering out and with time running out Brian Sheridan was to have the final say when he tapped over a thirteen metre free following a foul on Niall Lyons as he attempted a shot for a point. Referee Gough then brought the game to a close and with it the Senior seasons for both Ballinlough and Seneschalstown. Seneschalstown: David Lyons, Conor Cowley, Cormac Noonan, John Smith, Mark Fox, David Matthews, Niall Groome, Teean Cummins, Damien Sheridan, Sean Noonan, Brian Sheridan (0-03), Adam Carey (0-01), Bryan Clarke (0-03), Joe Sheridan (1-03), James Byrne. Subs: Mark Carey for M. Fox, Paul Carey for C. Noonan (black card), Niall Lyons for N. Groome, Niall Groome for C. Cowley (black card). Ballinlough: Keith McGuinness; Benji Smith (0-1), Michael Geraghty, Robbie Farrell; Emmet Smith, Lorcan Maguire, Johnnie Reilly; Kevin Devine (0-2), Tom McCullen; Colm Mallen (0-2), Ronan McGuinness, Cian Mallen (0-1); Peadar Byrne (0-3), Padraig Muldoon, Sean Geraghty. Subs: Junior O’Reilly for Lorcan Maguire.